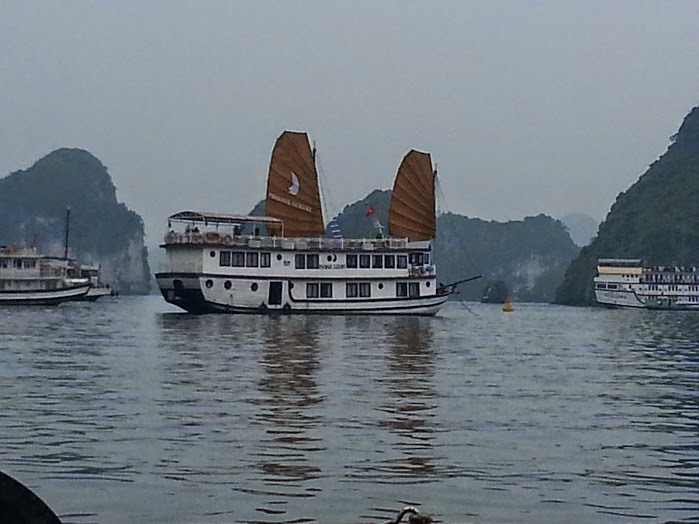 We broke up our 8 days in Hanoi with a trip to Halong Bay, which is to the east. There is a new road to the coast so the drive was only 3.5 hours. There we boarded our small boat to ferry across to the junk. Ours had 10 cabins that opened directly onto little walkway around the boat. It was all wood with Asian paneling throughout. Charlotte said it reminded her of the Dawn Treader from The Chronicles of Narnia movie/book. She was right. Very quaint and fun and she and I settled into our cabin with the boys in theirs. 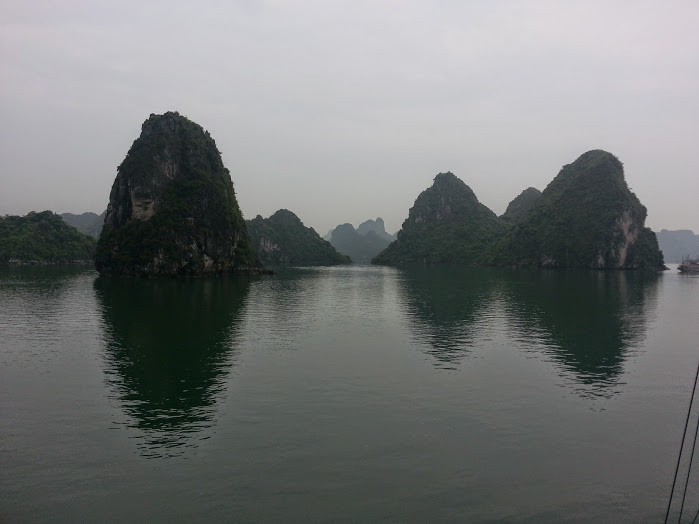 Halong Bay is a UNESCO world heritage site and has been named as one of the Seven Natural Wonders of the World. There are almost 2,000 small islands and some have caves or internal “secret” lakes as well. Amazing place. The first day it rained pretty heavily which was OK as we were going swimming anyway and it made the heat bearable. We went into the Secret Cave that was actually a few caves with amazing stalactites and stalagmites. Then we headed to a beach and swam. The next day we had kayaking and a row boat under a tunnel and into secret lake. There were monkeys on two of the islands but they were purposefully placed there and had the run of the island. Locals did feed them. 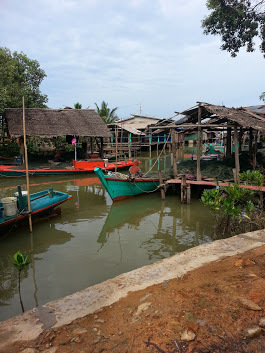 Many people used to live on floating fishing villages but now it’s dwindled down to just a few small groups as the government wanted to keep the place more pristine so moved them on. They do have one floating elementary school though. 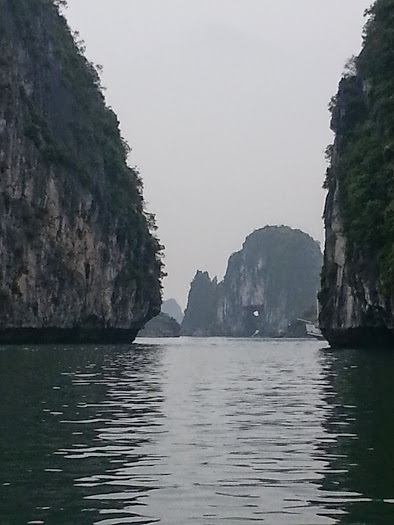 It’s an incredibly lovely area, filled with mists and rain and islands shaped like mystical creatures. I did find it rather melancholy though and it had a contemplative feel somehow. 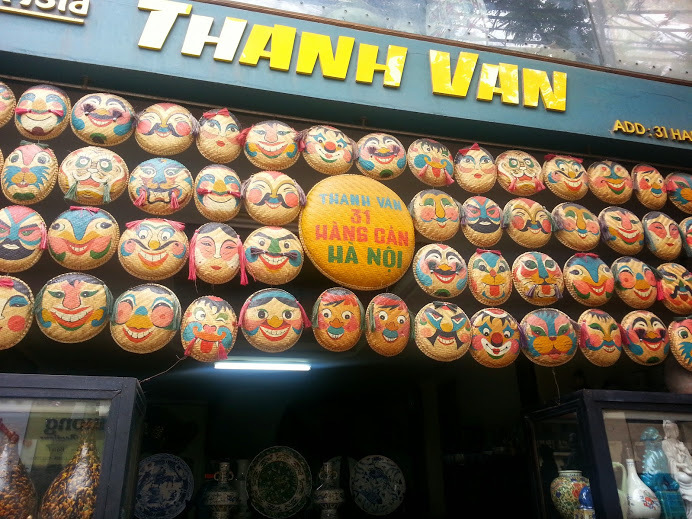 Last New Year when we were in Saigon we had to skip going up to Hanoi as it was too cold and we don’t have the clothing (living in Dubai does that to you). So we wanted to come this summer but now I wish we could have come a couple of months ago. It is HOT here. High 90s plus 80% plus humidity. It’s cloudy though so you don’t realize it is so hot until you’ve walked for about 10 minutes and suddenly realize your entire body/hair and clothing are soaked. We are perpetually sweaty – isn’t that a fun picture of our family! We are staying in the Old Quarter. 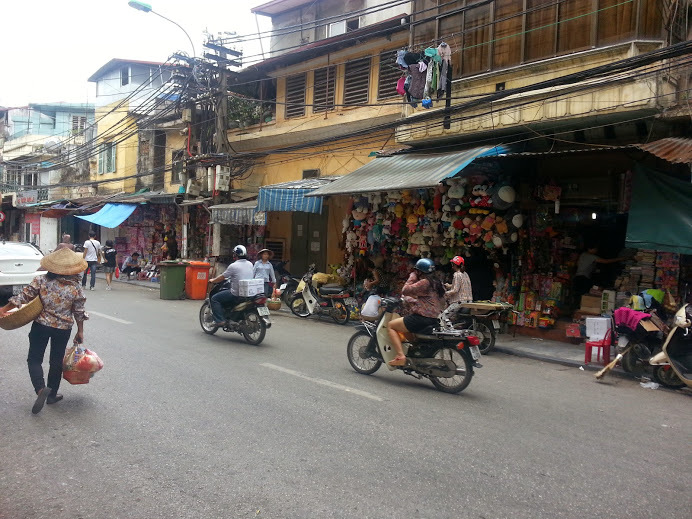 It’s certainly old with small, tree lined streets, packed little stores and restaurants, “millions” of motorbikes, and people. The sidewalks are filled with motorcycles or the little tiny chairs used for restaurants and many families can be seen sitting there eating meals together. People are also cooking on grills or selling fruits etc. Walking is very difficult and you have to jump on and off the sidewalk. Trash is thrown into the gutter so that needs to be sidestepped. It’s amazing architecture but hard to look at given all the street level hazards to be watched for. The first day we have just spent walking around and taking a one hour electric tourist taxi to get acquainted with this area. 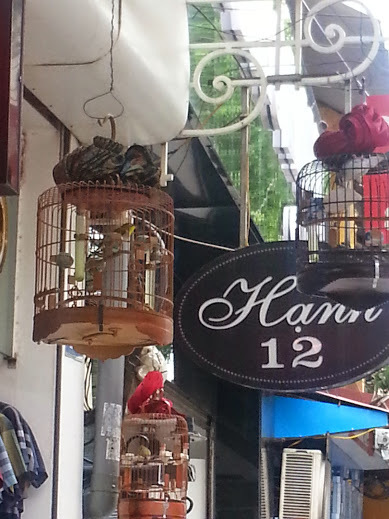 Over many of the shops there are cages with singing birds. 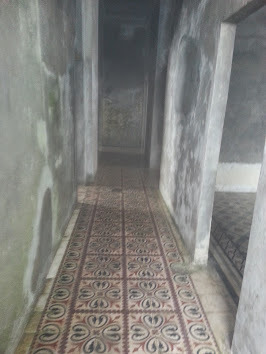 We also visited an old house that has been preserved. Many are disappearing or were torn down during the war time. How is this for a comfy looking bed? Makes our hard mattresses at the hotels look better! The Opera House. Sadly can’t go in except for shows and we couldn’t see anything playing. The Littles and I headed to the zoo and a couple of museums today while the big boys went off to the tunnels. 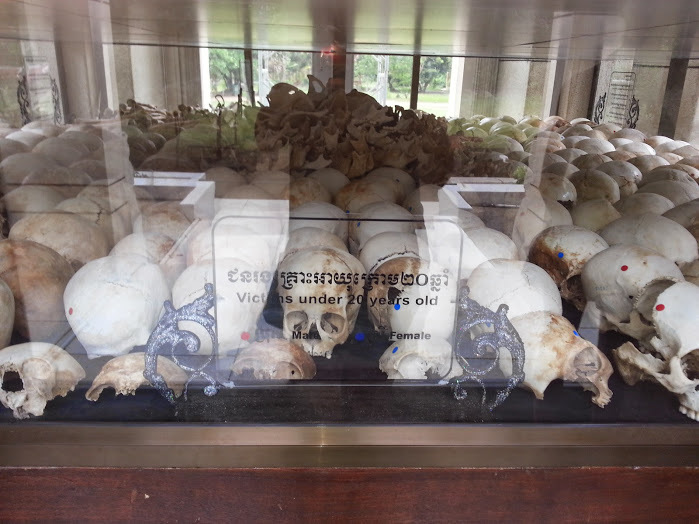 After the Killing Fields I thought we had enough of war for the younger two. 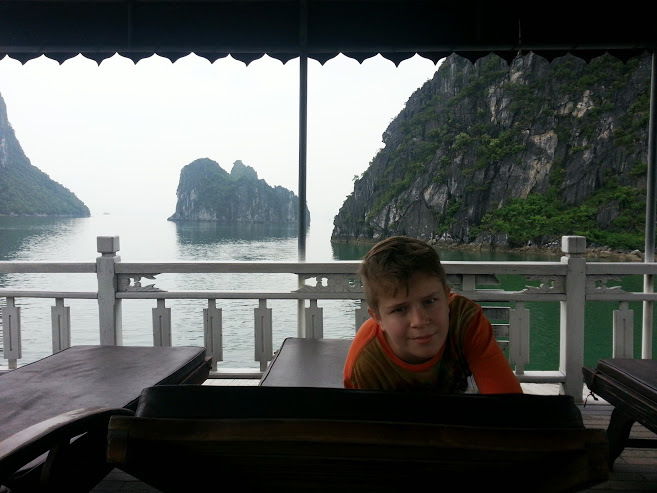 We had to dodge heavy rain showers so spent time with Vietnamese families in the zoo restaurants sitting it out. 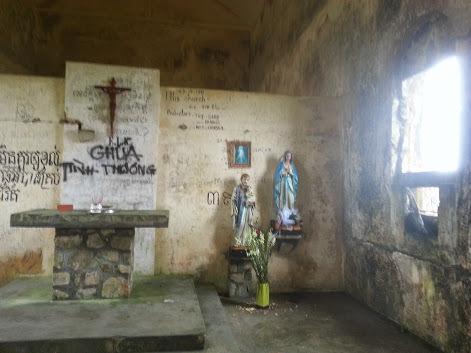 The place is a bit decrepit in places but no worse than others I’ve seen. 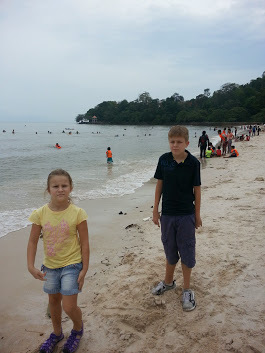 Last New Year we were there also and it was packed with families all out picnicking and enjoying the park like areas. 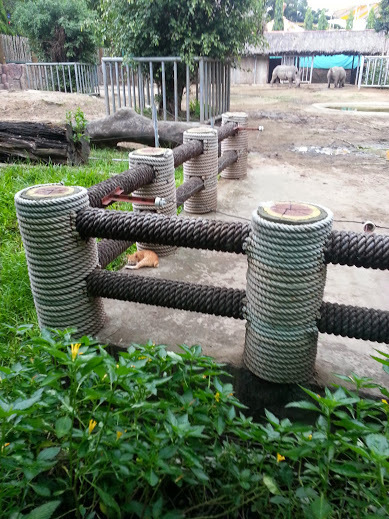 Cats are everywhere – even in the large animal cages like this. But they don’t seem to keep up with rats. We saw quite a lot of them running around! One just about ran over Jake’s foot the next day. 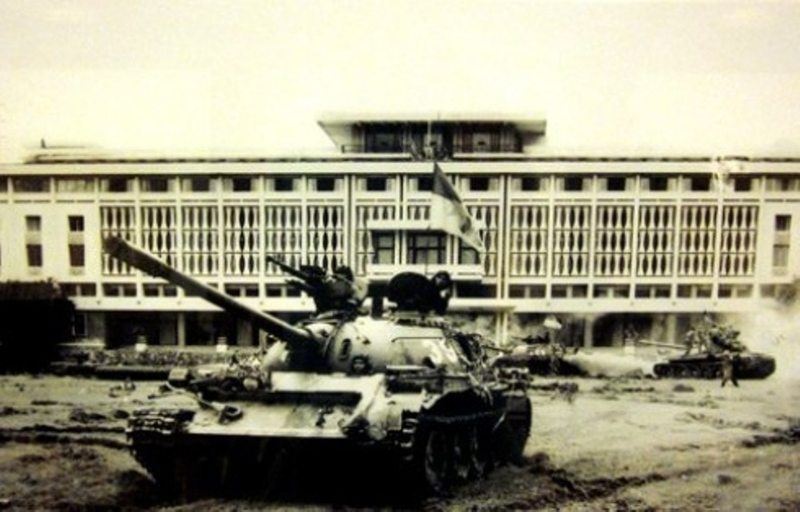 During the Fall of Saigon OR as it is known here, the Liberation. 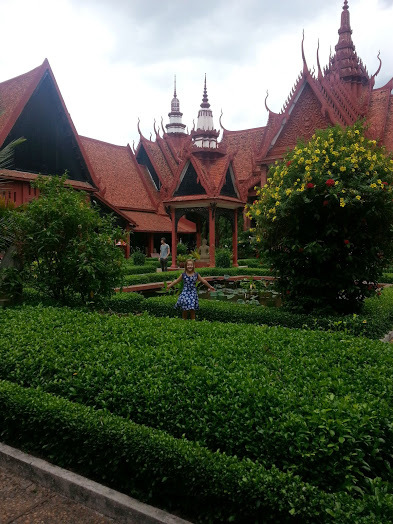 We had a really fun find in Kampot. 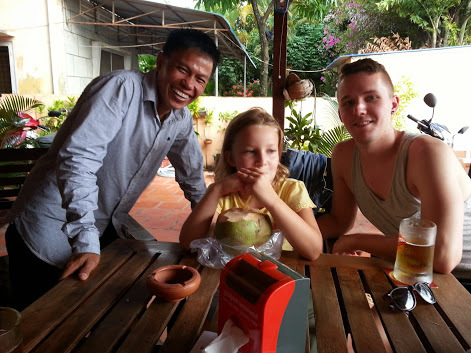 Our tour guide from last summer’s Angkor Wat/Siem Reap (Cambodia but about 6-9 hours away from where we were this summer) turned up. He was taking a couple around the country for 10 days and they were staying in our hotel. Vanny was an amazing guide last summer. Very knowledgeable about history and culture plus current issues. He also quickly understood what we liked and so took us through forests and in to temples by scrambling over rocks etc. Made it fun for the kids. It was so much fun to catch up and a very “small world” moment. 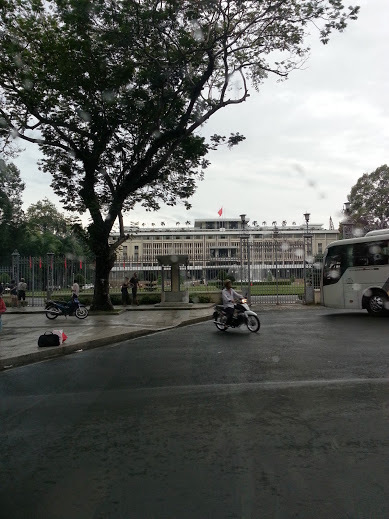 The next day we drove to Ho Chi Minh/Saigon. It took us almost 10 hours with two minivans and a walk across the border. Luckily we hit the border early and were the only ones there so it was fast. The people remembered us and so it was a great catch up time with the people who run it and their little girl who Charlotte had really enjoyed playing with. Later the server at the restaurant remembered us as did the old lady who walks around selling books. It was quite enjoyable to know people. Sometimes returning to a place is relaxing and you get to enjoy it in a different way. 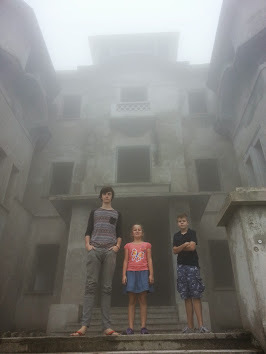 We drove up Bokor Mountain from Kampot. It was about 4 hours round trip. Not that far but the road is windy and near the top visibility is so bad that it slows everyone down. This is the second highest mountain in Cambodia and also a national park. 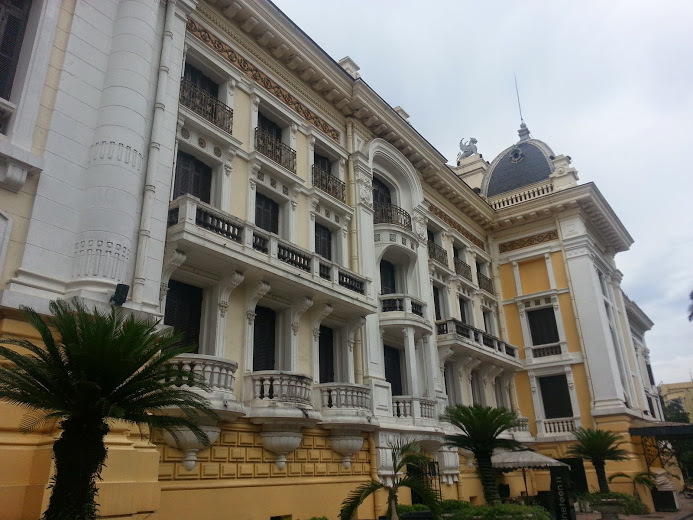 It was built by the French as a hill station/casino in the early 1900s. Now abandoned and ghost like, the huge building looms out of the mist. It was very surreal as the fog was so bad we could only see about a length of a car in front of us. We walked all around the place and it was just plain weird. 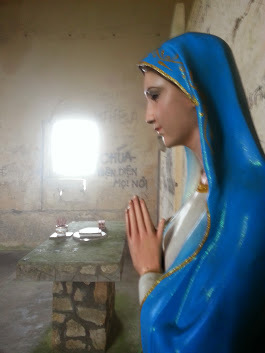 The best was the stop at the old church. 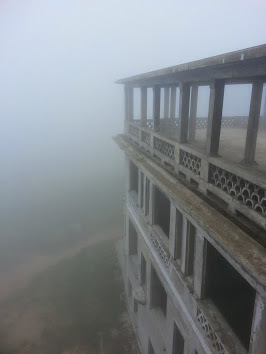 It was very foggy but no rain and we climbed up behind it to a broken down gazebo area that probably had amazing views given the steep drop offs we could just about see. 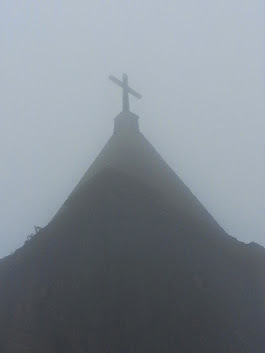 The church was so strange stuck up on this mountain. Later we stopped at a fishing village that had all Cham living there. 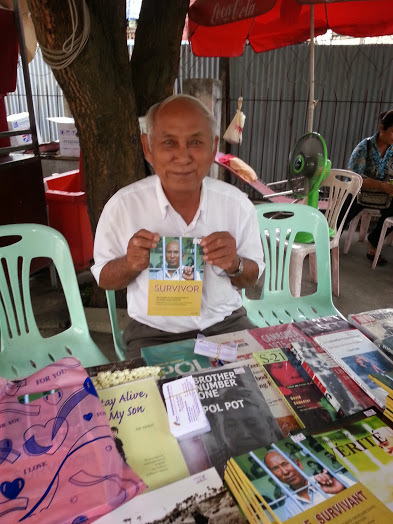 Cambodia is an interesting mix of people with the Muslims in the region called The Cham people. They are an ethnic minority and seem to suffer in various countries around the region sadly. The boats go out in the evening and come back the next morning because of the low tide. It’s quite a site to see them all heading down river. Seems to be good support by NGOs in the area plus loved this pro breastfeeding poster. 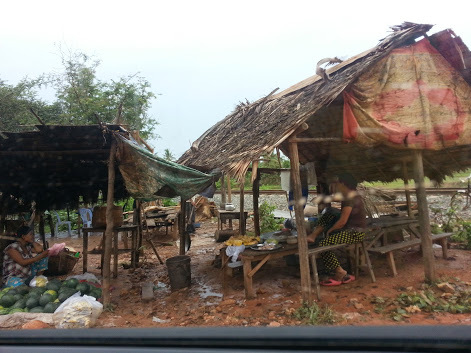 We hired a car to drive us to Kampot which is about 2.5 hours south of Phnom Penh. It was comfy despite 4 of us in the backseat but a nice Lexus 4-wheel drive. Not bad for $60. The longest part was leaving the city as it was heavy traffic and then the road is narrow so you have to dodge tractors, lorries, carts, and of course hundreds of motor cycles and tuk tuks. Driving is quite harrowing in Cambodia and I wouldn’t want to attempt it even with my Dubai skills! 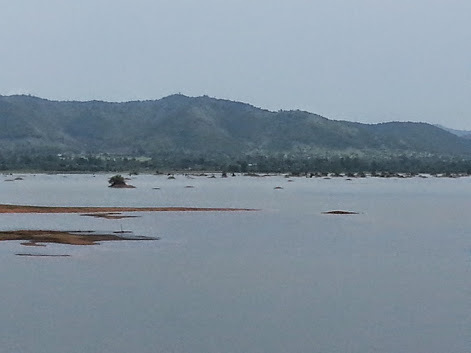 Kampot is a river town about 20 minutes to the ocean (Kep) and sleepy, laid back place. This area was the French Riviera of Asia 100 years ago and the old, crumbling, colonial houses still stand. A few have been redone but most need vast amounts of work and are falling down or have been patched up haphazardly. We stayed in a new place run by an Australian guy. Clean rooms, good bathrooms, cool air, and soft pillows (sadly not mattresses though) hooked us. Rooms were about $40 a night so on the higher end for the area. We were intrigued by the people visiting this place. There was such a range from older couples to Australians with children and some backpackers. There were a few of the truly out-there backpackers with the dreadlocks, dirty clothes, and of course barefoot but most people visiting were kind of average. I wonder how they all heard about the place as it gets a tiny mention in guidebooks. Maybe word of mouth like us. 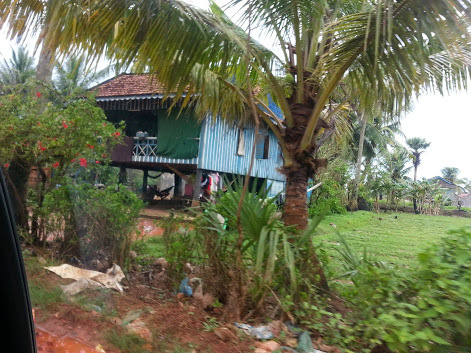 The region has a history of agriculture and is famous for peppercorns (Kampot pepper) and salt. There are large salt flats around but it is the rainy season and fresh water washes salt away so we didn’t get to see that in action. The pepper farms are neat. 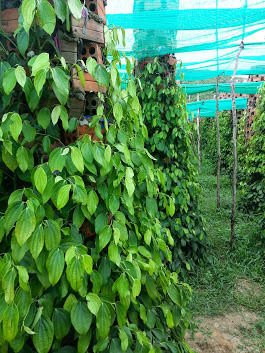 It takes 4 years for the plants to grow peppercorns and then they get one crop a year we were told. 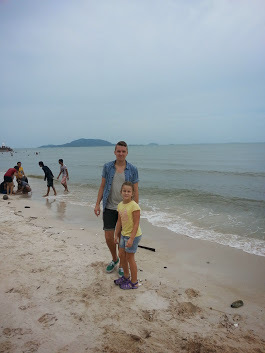 Kep is on the ocean and we visited on a Sunday so got to see lots of local families and minivan loads from Phnom Penh playing on the beach. I believe we were the only Westerners around just about and we were a curiosity. The kids are used to having their pictures taken and patted a bit now though. 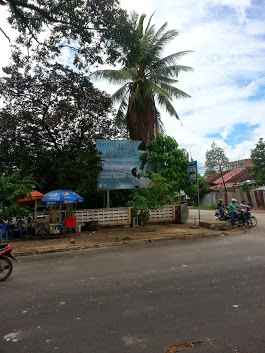 Kep is also “famous” for it’s crab. We had lunch in one of the restaurants in a long row that are built out over the water. Nice to have the ocean under us with gaps in the word to see it by! 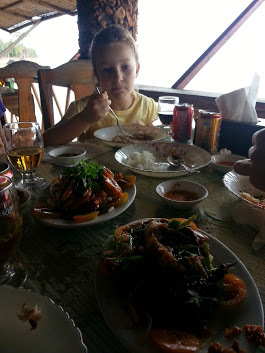 We had crab, shrimp, and squid all cooked with Kampot pepper. Very good although one tiny peppercorn per bite was all I could handle. We drove through the countryside and past the secret lake. This takes you by many small roads so you can see family life there. The poverty is pretty intense. Most houses have small ponds beside them and this is where bathing and washing clothes takes place. Many women were standing in them scrubbing out clothing. The fields of rice seemed to be in planting stage as lots of people wading through the mud and leaning over planting. Tons of white, skinny cows and also water buffalo used to pull the ploughs. Pigs and piglets, ducks and tons of chickens are around the houses. Sadly most of the days we also saw children working in various capacities. Too many cannot go to school for lack of money and so work for the family. It’s a very hard life for so many. The mud from rains and flooding makes additionally hard. In a month or two some of those roads we drove on will be underwater. I can’t fathom how they will manage but they do. Another day in Phnom Penh. We spent the day in the main city this time and visited the National Museum which is next to our hotel and then in the afternoon the Royal Palace. 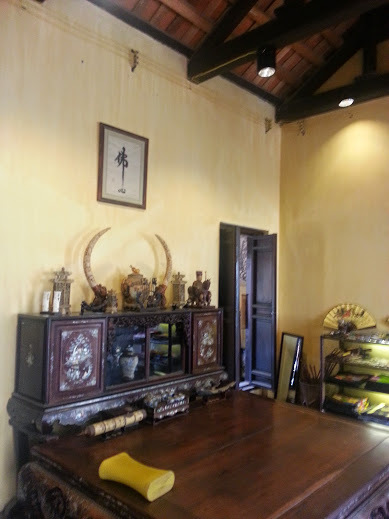 The museum is interesting and filled with stone statues and doors etc. 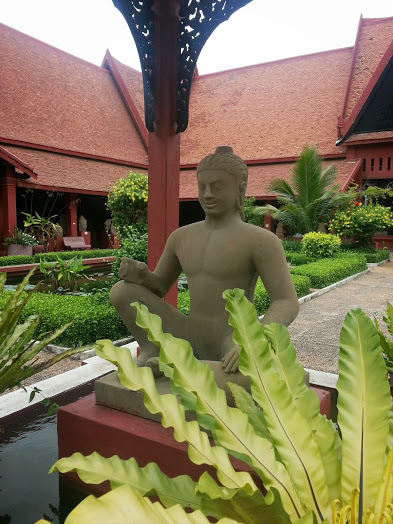 If we hadn’t been in Siem Reap last summer we would have enjoyed it more, but seeing these same statues and large blocks of Sanskrit stones out in temples was more rewarding somehow. Still the building these are housed in was lovely. I photographed that more. It was an art museum built in the early 1900s. At lunchtime we sat out a huge rainstorm that reminded us we are in a tropical climate. The humidity is a bit oppressive at times but a cold glass of beer and fruit smoothies helps. 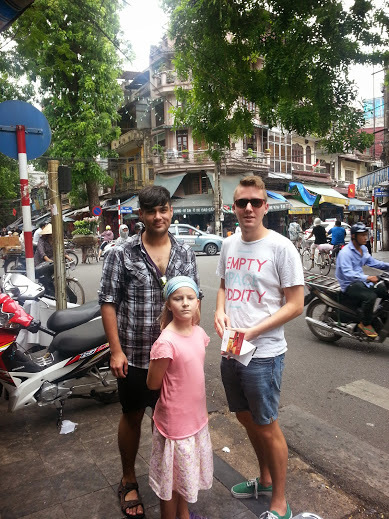 We then visited a local, huge market. It was a little intense in the raw meat and wiggling fish/dried fish aspect. Tons of duck and hen eggs plus the black dirt ones were available. 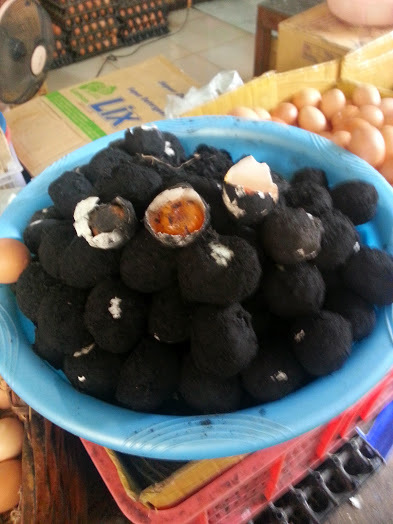 These are eggs that have been left in salt to kind of ferment and then stored in black dirt. The yolks are thick and solid yellow – somewhere between cooked and uncooked. The other ones are fertilized and then cooked so you eat an “egg” that includes a slightly crunchy beak, wings, and feet. We took photos and ate neither I have to say. 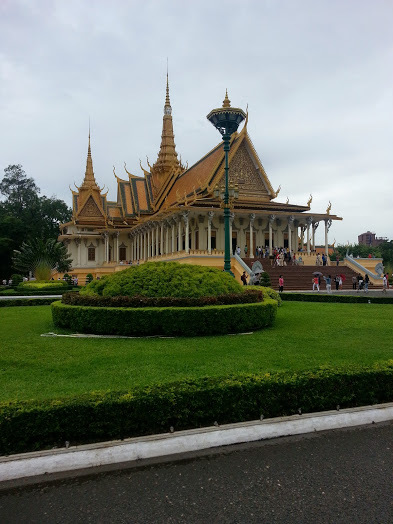 The palace is an interesting complex with many buildings being currently reconstructed but some finished and lovely. The King was in residence as his flag was flying. 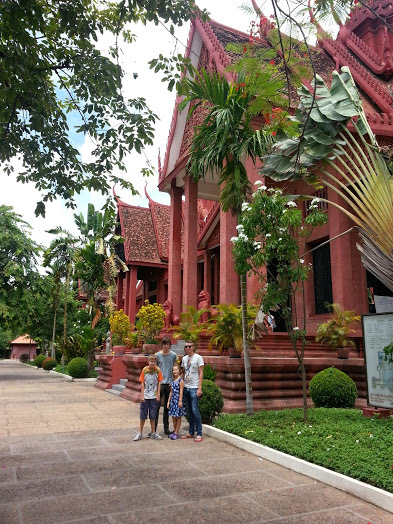 Our guide told us that he came to the throne of Cambodia a few years ago after 22 years in Paris as a ballet dancer. He is not married at the age of 63 but doesn’t need to be “because he spent many years in Paris as a ballet dancer.” We aren’t sure what that meant. The royal tour guides and staff plus King all wear different colored outfits related to the day of the week. It’s a lovely rainbow with today (Friday) being blue outfits and tomorrow purple. Interesting and colorful! 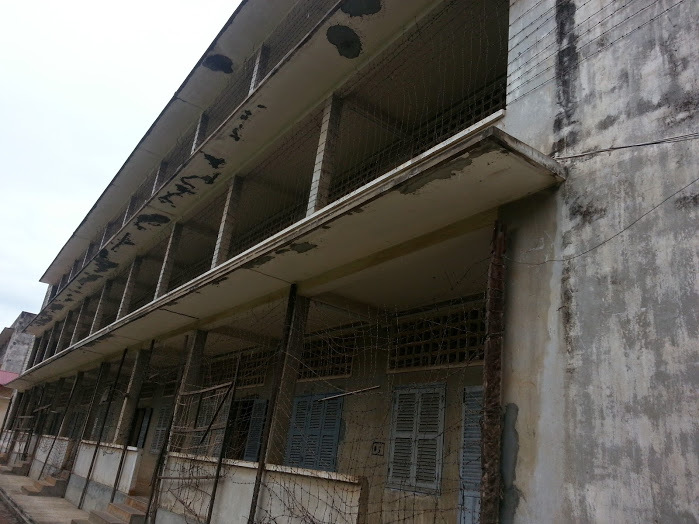 After the Killing Fields we went to Tuol Sleng which is an old high school that was taken over by the Khmer Rouge and used as a prison (S-21). 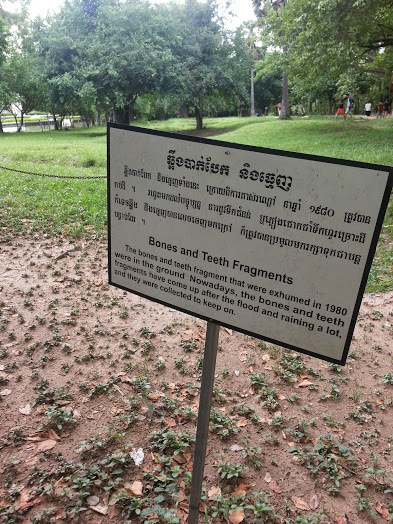 It is estimated that about 20,000 prisoners were in here awaiting transport to the Killing Field where they all were put to death. In the prison they were tortured brutally and kept in inhumane conditions. Men, women and children all were processed through this center on their way to die. 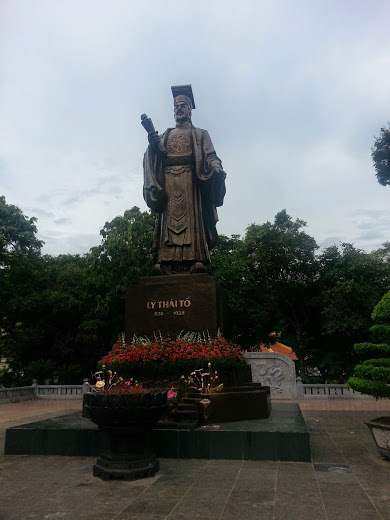 Educated people were particularly at risk and the guide told us often that teachers and professors were killed. We got to meet one of the seven survivors of the camp. Chum Mey was locked up for a couple of years but because of his skills as a mechanic he was not sent to the Killing Fields. He has since written a book to help document what happened and spends a lot of time at the museum to share with people. He has problems with his hearing because of the electric shocks that were given through his ear, is missing toe nails, and cannot move some fingers correctly. He was very friendly with the kids but they (and me) were a bit overwhelmed by the place to engage fully. 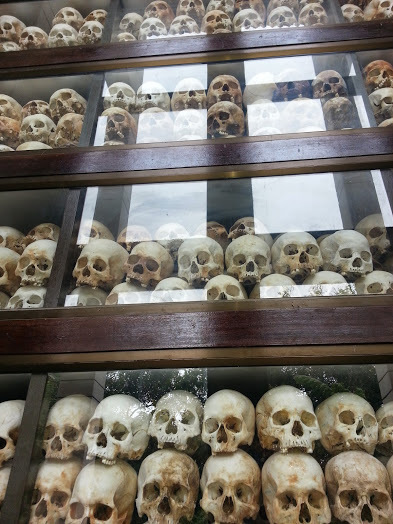 Today we went to the Killing Fields and Tuol Sleng Genocide Museum. I knew this would be difficult and tried to prepare the younger two as to what to expect but it was still rough for all of us. 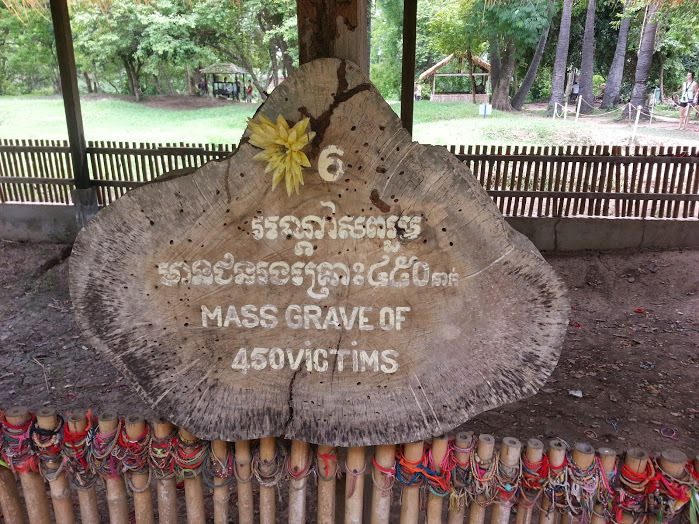 The Killing Fields is just one of hundreds of mass grave sites in Cambodia where people were brutally murdered by Poll Pot’s army from 1975 to 1979. This one had 8,895 bodies discovered. These were men, women, and children and the bones, teeth and clothing are still making their way out of the ground today. We stepped over shards sticking out on the paths. Clothing pieces can be seen with just corners sticking out. The old tree where babies were killed was too much for photos. Bucolic sites with horrific history. 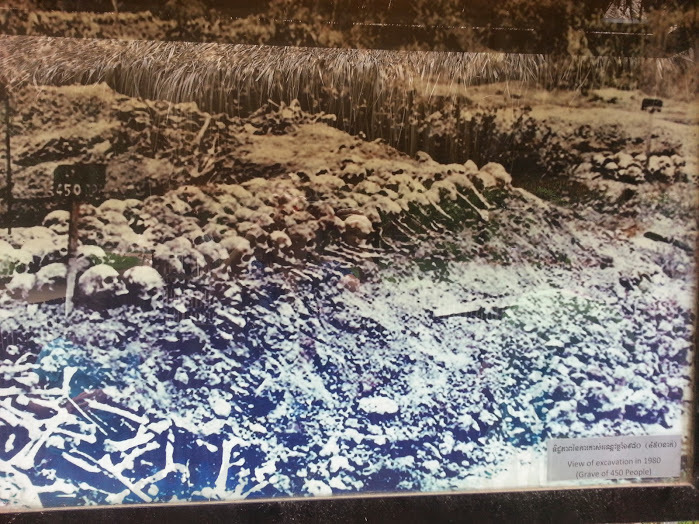 These indentations are some of the mass graves. Went to a great restaurant tonight. Friends is one of a small group around the region that trains former street children to cook and serve in the restaurants. It has a much larger goal as well and provides a multitude of programs in technical training and education. We had all kinds of amazing dishes that use local ingredients in new ways. 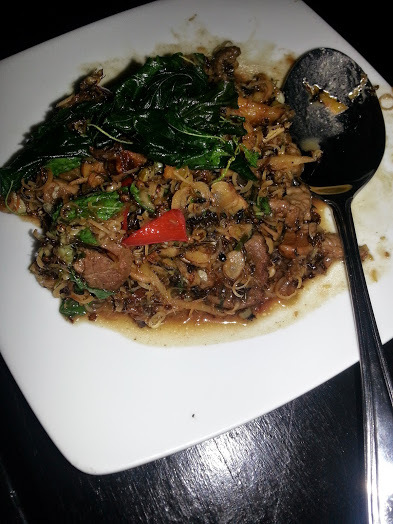 This one was beef with lemon grass and black ants (a mix of little ones and juicier big ones with wings). The desserts are particularly good. 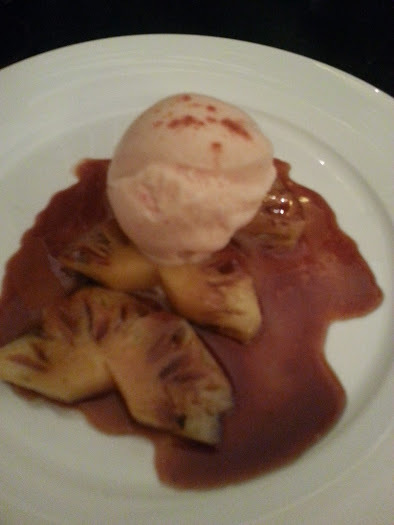 This one was pineapple with palm sugar caramel and chilli ice cream. 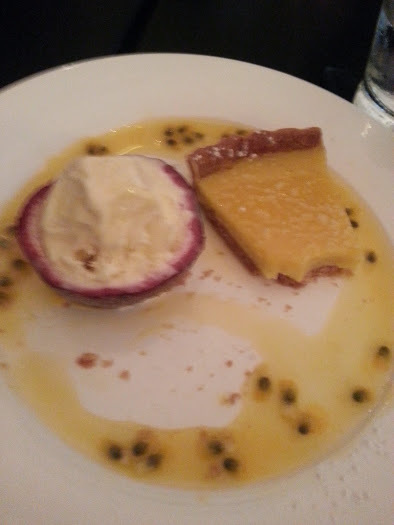 Then passion fruit tart with white chocolate ice cream. 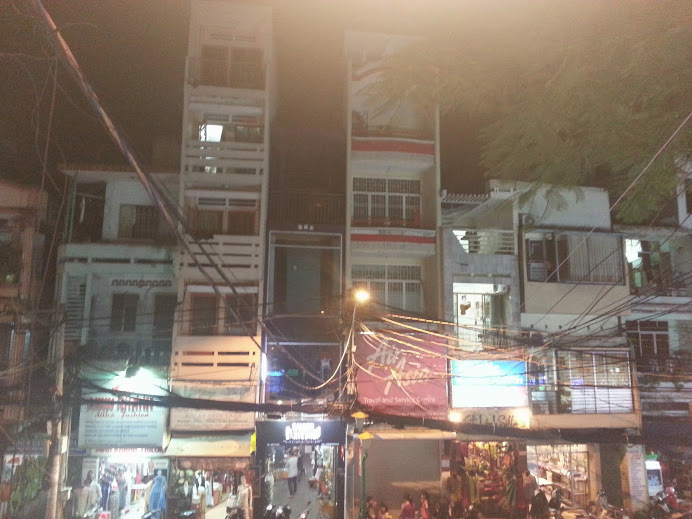 “In Phnom Penh there are, on a daily basis, 1,000-1,500 street children who have completely cut ties with their families and have made the streets their home. According to the figures accepted by UNICEF, there are between 10,000-20,000 street children working on the streets, who have kept ties with their families and return home either regularly or irregularly. 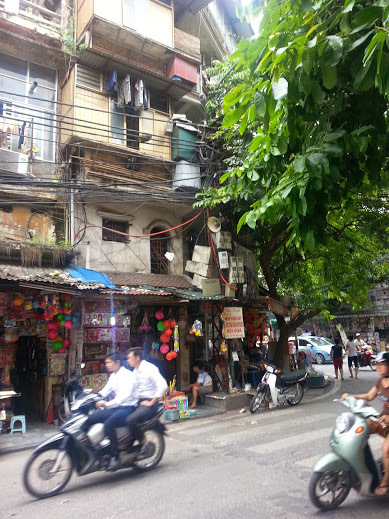 Mith Samlanh estimates that there are between 500 and 1,500 children belonging to street living families. This figure fluctuates, depending on the situation in the provinces. Cambodia has a young demographic structure with 44.3% of the population under 18 years of age. A combination of severe decimation of the population during nearly three decades of war and civil conflict, a post-war boom and the low average life expectancy of 57 years, are reasons behind the unbalanced population demography.